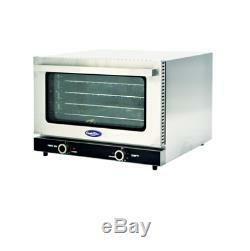 Atosa CRCC-50 Commercial Countertop Convection Oven. High performance rear fan and specially designed diffuser distributes heat evenly throughout the bake chamber -120 minute bake timer feature automatically switches oven off after set time cycle -Baking temperature ranges from 150°-500°F (65-300°C) -Stainless steel baking chamber provides reliable operation and easily daily clean -Oven door is constructed of double pane tempered glass providing an insulation barrier keeping the glass cool when oven working -Interior light in chamber makes monitoring cooking easier -Removable wire rack holder for easier clean -NSF, ETL. Stainless Steel Oven Chamber: Yes. Number of Motors/Fan(s): 1. Number of Interior Lights: 1. Manual Reset Hi-Limit Protection: Yes. Dimensions: 23"W x 22 3/4"D x 16H. California, Illinois, Washington, Florida and Massachusetts. There are NO ADDITIONAL charges if you are picking the item up from our warehouse location and we are glad to help you load the item. Please bring rope or tie downs to fasten the item securely, we DO NOT supply any. Mike's Restaurant Equipment & Supply. 1637 N O'Donnell Way. Thanks For Visiting and we look forward to hearing from you soon. The item "NEW 1/2 Sheet Mini Convection Baking Oven Electric Atosa CRCC-50 #8426 ETL NSF" is in sale since Thursday, June 14, 2018. This item is in the category "Business & Industrial\Restaurant & Food Service\Commercial Kitchen Equipment\Cooking & Warming Equipment\Ovens & Ranges\Convection Ovens". The seller is "orangecountyequipment714" and is located in Orange, California.